Looking for a healthy meal that is quick and easy to prepare? Something that will have you in and out of the kitchen in 30 minutes flat? Look no further, this recipe will have you sitting down to an enjoyable dinner before you can learn to say νιψονανομηματαμημονανοψιν! Minimal prep time, basic ingredients, and very little supervision are required for this dish from the Aegean islands. I first ran across variations of this dish on the island of Santorini, where I was working in the mid '90s. Being the adventurous sort, I spent a couple years getting the "Summer Lovers" thing out of my system by escaping to the Greek isles and experiencing all that they have to offer. Let me just say that the reality was everything I had imagined it to be and more. If you have ever considered just chucking everything and going to ground somewhere in the Aegean for an entire summer, I urge you to do it without a second thought. If you have yearned to experience the stark afternoon light of Helios while wandering among whitewashed walls and cobblestone streets, as a scintillating blue sea laps against the shore and the Etesian winds blow, now is the season to start packing. Time stands still on a Greek isle, but you need to get there first. 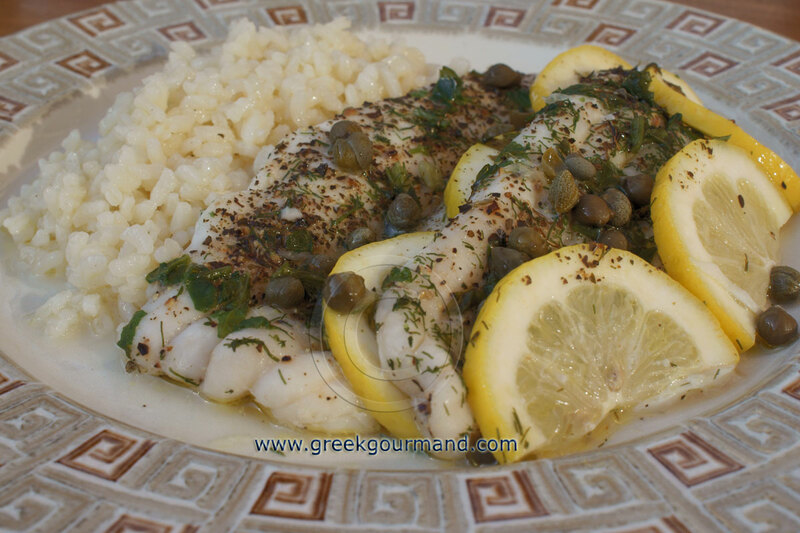 This fish recipe is a small sampling of the flavours that mingle among the Cyclades. Serve this dish with a side of rice and some steamed asparagus, along with some Assyrtiko wine. And, if you do decide to visit Santorini, be sure to leave with some capers (harvested from the wild throughout the island), along with your memories. 1. Wash the fish well under cold water and pat dry with a paper towel, then salt and pepper the fillets and set aside. 2. Slice half of the lemon into thin slices, then cut the slices in half. 3. Pour 2 tablespoons of the olive oil into your baking dish and start to layer/arrange the fish and lemon slices alternately in the vessel. 4. 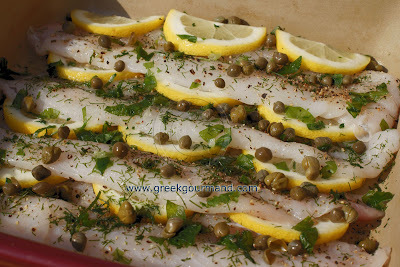 Sprinkle the oregano, dill, capers and fresh green onion (or celery leaves, or parsley) over the fish and lemon slices. 5. Drizzle the final tablespoonful of olive oil and squeeze the juice of the remaining half lemon over everything. 6. Cover the baking dish and bake at 250°F for 30 minutes.